MOHD MAJID MALIK ,BHADERWAH,Dec 23– Congress CLP leader , former minister who was also the sitting MLA of Bhaderwah Mohd Sharief Naiz loses Bhaderwah to BJP’s Daleep Singh Parihar . 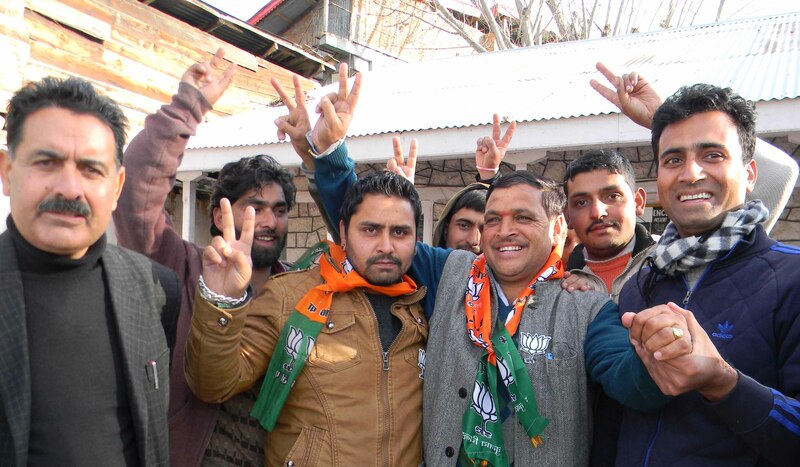 “Congratulations to Daleep Singh Parihar for his victory in Bhaderwah . I wish him and the people all good luck for the next 6 years. He’s now my local MLA,” said Mohd Sharief Naiz to media persons outside counting hall when BJP Daleep Singh Prihar was declared victorious . Naiz had won this seat in 2002 and 2008 assembly elections and was Power minister in 2002 government led by Mufti Mohd Sayeed and became the CLP leader of party in 2013.He was among the prominent losers. BJP Daleep Singh Parihar won the Bhaderwah assembly seat by a margin of over 800 votes .This was Naiz’s first defeat in assembly elections since 2003 .’I am thankful to the people. This was a challenge for me. I have given an answer,” said Parihar . He also said that the BJP has now become as a relevant party in Chenab Valley where it is emerging as the second largest party and said that only BJP could change the Bhaderwah people fortunes. Parihar credited Prime Minister Narendra Modi for the victory in Bhaderwah and said, the results of today asserts that the BJP’s dream of Congress-free India will become a reality.As soon as the BJP candidate was declared victorious by the election officer thousands of supporters of the saffron party carrying its flags and banners began dancing to the tunes of ‘dhol in whole Bhaderwah town and also busted crackers and cadres were seen in a festive mood .Shouting ‘har har Modi,’ the BJP activists distributed sweets and also greeted and hugged each other. It is also notable to mention here that PDP sheikh Mehboob Iqbal remained on number 3 by getting 16,533 where as Congress which is on number two received 24,287 votes and BJP 25,746 votes .